Christopher Marianetti, Co-Founder & Artistic Director of Found Sound Nation, is a composer and producer from Albuquerque, New Mexico. His works have premiered at the International Gaudeamus Competition, Merkin Concert Hall, Massachusetts Museum of Modern Art, The Stone, and the Tenri Cultural Institute among others. Recent works include: an animated score for brass band projected onto the sides of Manhattan buildings, and a symphonic work for a group of lowrider automobiles for the 2012 ISEA festival in New Mexico. With Found Sound Nation Chris has led site-specific music projects in New York City, India, Mexico, Zimbabwe, Italy, and Switzerland and was recently awarded the PopTech Social Innovation Fellows Award. Chris is an active teaching artist with the Weill Music Institute at Carnegie Hall. Chris trained in composition at the Accademia Internazionale della Musica in Milan, Italy and received his Master’s in music composition from Brooklyn College Conservatory of Music. Jeremy Thal, Co-Founder & Artistic Director of Found Sound Nation, is a horn player, composer, and educator. He studied horn, ethnomusicology, and Chinese at Northwestern University, and continues to work as a performer, playing in major music festivals and obscure bookstores around the world. With fellow co-founder Chris Marianetti, Jeremy co-designed Found Sound Nation’s approach to socially-engaged music creation, and has co-led FSN projects in Haiti, Zimbabwe, New Orleans, Mexico, Indonesia, Italy, and Switzerland. For the last 3 years, Jeremy has served as a lead teaching artist at the Weill Music Institute at Carnegie Hall, running innovative music production workshops with incarcerated youth in New York City. A founder of ZeroBit Music, he composes and produces music for film, theater, web sites, and video games. As a horn player Jeremy has recorded and toured with indie rock heavyweights Jeff Mangum and The National, and leads his own band, Briars of North America.dit. A Csapat első és utolsó tagja is befutott! // The first and last member of the TEAM! Vas Márk István 24 éves. "A zene a mindenem és minden napom. Édesapám vonalán zenész családba születtem, ezért már gyermekkoromban nagyon nagy szerepe volt a "hangoknak" az életemben. Főleg a Neo-Soul, Jazz Hip-Hop, Acid Jazz és a Funk vonal mozgat. Hangszerem a basszusgitár, amivel sikerült a Snétberger Zenei Tehetség Központba felvételt nyernem, ahol az elmúlt 2 évben rengeteget tanultam. A jövőben szeretnék továbbra is zenével foglalkozni. My name is Márk Vas István. I'm 24 years old. Music is my everything and my "everyday". My Father comes from a musician family so sounds had a huge influence in my childhood. Mainly I listen to Neo-Soul, Jazz Hip-Hop, Acid Jazz and Funk. I play the bass with I got accepted into the Snétberger Talent Center. Since the last two years I have learned because of this opportunity. In the future, I would like to go further and dig deeper in the realm of music. A CSAPAT ... és még nincs vége! // The TEAM ... and this is not the end! Siska Tamás (22): "1992 be születtem Makón. Zenei általánosba, majd zenei szakközépiskolába jártam. 1 évig diákkent, utána mint, zenei segítő voltam a Snétberger Zenei Tehetség Központban. Sok kisebb jazz formációval szerepeltem mar, most jelenleg a Möntörvényüek jazz quintettben játszom és Varga Viktor zenekarának (VARGA BANDA ) vagyok a dobosa." Tamás Siska (22). "I was borni in Makó in 1992. I was studiing in a primary music school then in a music trade school. For 1 year. First as a student later on as a mentor worked at the Snétberger Music Talent Centre. I have been playing with several different jazz formations, right now I'm a drummer in the "Möntörvényűek"jazz quintett and in the band of Viktor Varga ( Varga Banda)." Balogh Olivér a fedélzeten! // Olivér Balogh is on the board! Balogh Olivér (22) "5 éves korom óta tanulok zenét.. Klasszikussal kezdtem, 10 évig trombitáltam. Majd jött a basszusgitár, amin jelenleg is játszom a Delight Inc. zenekarban. 3-4 éve kapott el a hip-hop világa, nagyon megszerettem, a kedvencemmé vált.. Beateket hangszerelek/írok illetve rappelek. Nagyon örülök, hogy belekerültem ebbe a projectbe, s remélem sok jót tehetek hozzá." Olviér Balogh (22) "I have been studiing music since I was 5. Started with classical music, had been playing tromphet for 10 years, then I met the bassguitar. Now I'm playing on it at the Delight Inc. band. Hip-hop enchanced me 3-4 years ago, I got to like it a lot! I'm scoring, writing beats and making rap. I'm very happy to got into this project and hope I can give it to a lot." Nagy Gergely (23 éves.) "Budapesten lakom. 3. éve a Snétberger Zenei Tehetség központban vagyok mint diák. A zenével 17 éves koromban kezdtem el autodidakta módon foglalkozni. Hangszerem: percussion. Kedvenc stílusaim a flamenco, a balkán, a brazil-szamba és bossa-nova. Inkább világzenét játszok szívesen, abban kötöttségek nélkül tudok muzsikálni. Szeretnék nyitni a zene által. 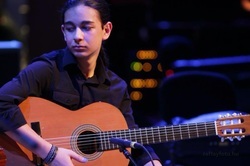 Álmom hogy egy saját flamenco zenekarban vegyek részt, és bejárjam vele a világot.."
Gergely Nagy (23 years) "I'm living in Budapest and it's my third year as a student at the Snétberger Music Talent Centre. I've taken up music when I was 17. My instrument: percussion. Összeállt a csapat! // The Team is ready! "A Baranya megyei Gödréből jövök, testvéreim és én kiskorunk óta zenélünk, hangszerem a gitár. A jazz és a flamenco a hozzám legközelebb álló műfaj de mindenre nyitott vagyok. Szeretném a legkomolyabb szintre fejleszteni a zenei tudásomat, célom ebből megélni." "I was born in Gödre in Baranya state, my sibilings and I have been playing music since childhood, I play the guitar. Jazz and Flamenco are the styles that lay closest to me, but I'm open to everything. I would like to develop my musical knowledge to a professional level, my goal is to make a living out of it."